Auro Infotech being in deep client focus to software development companies in U.S and Europe. We have a highly skilled and professional team of developers who can deliver world-class software solutions. We have all the resources to make a project successful with software developers, QA experts and technical communicators. The client who outsources their projects to Auro Infotech surely benefited by lower cost, greater quality and on time delivery of projects. We sign non-disclosure agreement to safeguard our clients’ proprietary information rights. The concerned business houses are clients who are engaged in business other than software development. On account of their years of experience in their exposing field they posses core domain knowledge of their business sector - ie. the key asset for transforming a business. These fields could be Finance and Accounting, Logistics and Warehousing, Hospital & Pharmaceuticals etc. To improve their customer service or to make the business tune to the changing demands they may need software solutions. These types of clients can utilize the technical capability of Auro Infotech to develop and implement the business solution to catalyze their business growth. Companies in UK and Europe who are involved in software marketing or those who want to venture into software marketing can build a business relationship with Auro Infotech. They can market the products and services of Auro Infotech. Or they can identify software requirements for business applications and refer leads and opportunities to Auro Infotech. The business relation will be worked out on mutually acceptable terms and conditions. Auro Infotech methodology represents a powerful combination of the best industry-proven practices and leading standards, is focused on streamlining the development process to increase return on investment (ROI) and compress time-to-market. Usually these clients are ISV’s from USA & Europe they maintain a development team in their premises in USA or Europe. Here our team works along with their development team and update /amalgamating the works that done here for them with their server. They give a task or module and give a deadline. As per the specifications of their requirement, the excusive team of that client at Auro Infotech facility executes the requirement at Auro Infotech facility with in the dead line. Auro Infotech have developed and keep a pool of business models as befitting with the varied needs of heterogenous UK client requirements. Clients can choose any of the business models as compatible with their business requirements and convenience. Auro Infotech always open to any business models from our client side too. This model is recommended when the scope and specifications of the project are very clear. By adopting the flexible and scalable design we ensure that most changes to requirements are taken care of with minimum effort and time. 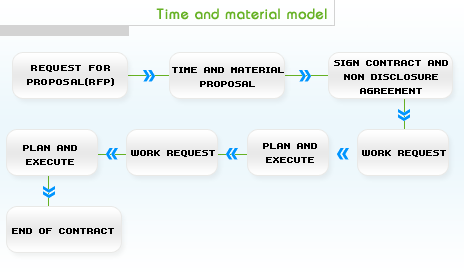 This model is usually adopted for product development or when the client is not very clear on the requirements. This model is also used for project maintenance where streams of bug fixes or enhancements are expected. The payment is specified in man-hour or per man month basis. As per this model, we have create and maintain an exclusive team for the client. The client will have one or more persons at his facility to interact and to coordinate with his hired team at Auro Infotech. The work will be replicated on a daily basis to the development server. UK the client will be in total control of the development and progress of the project. This model is especially suited to product development. Auro Infotech is ready to share the development costs of the product with the client. We can invest up to 50% of the development costs depending on the assessment done by UK. 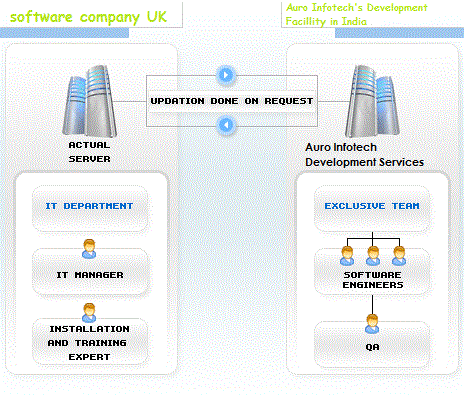 Auro Infotech software is the one stop ODC to all the development needs of heterogeneous UK clients worldwide. Auro Infotech have own resources to meet the varied needs such as custom product design, product development, QA, technical communication, graphic designing & SEO services. Auro Infotech custom product development services comprise, outsourced product development, legacy product development, component development and custom development .Auro Infotech can develop independent products on .Net, PHP, Asp.net and J2EE… with databases such as MY Sql,DB2,Oracle, SQL server. We are proud to say that Auro Infotech have facilities and infrastructure to execute automated load & stress test, functionality test, performance test etc. Though India is a common destination for offshore services, only a few companies do offer in this sector. In Auro Infotech, our expert communicators can understand the pulse of your targeted receivers, clients or audience and can craft messages as compatible with their field of experience. So friction in communication is a myth to the technical communication materials that crafted in our facility. Auro Infotech world class graphic designing team with updated knowledge in newbie’s technologies, promises renovated look and feel to your website, though you already have a website or you think to craft one. Our CG experts with versatility in HTML, Flash Animation, Adobe Photoshop and Dream Weaver like software’s and craft websites that promises the reach of information to your target clients. Our SEO experts do much to enhance the visibility of your service/products website. Auro Infotech have in-house team having in depth expertise in varied vertical domains. We have our own experts in excellent software designing, skillful software development, keen QA, expert documentation, corporate communication, SEO and world-class graphic designing. All experts having passion for their chosen field and hold 3 - 7 years of experience in their chosen sector. Manufacturing and Logistics, Automotive, Embedded Software, Financial Services, Government, Health Care and Medical, Insurance, Internet / Web Applications, Marketing Research and Consulting, CRM, ERP, CMS, , Non-Profit, Pharmaceutical, Real Estate, Hotel management, Auto mobile, Ware house management School management, college management,Hospital Management Small Business, Software Products and R&D, Trading/ Retail / Commerce, Transportation, Travel, Graphic Design, SEO, Communication, QA (Automated, manual). Macromedia Flash, Adobe Illustrator, Macromedia Dream weaver, HTML, XML, jQuery, CSS, PageMaker, Adobe Photoshop and 3D Max. Auro Infotech gives prime importance to the security of your intellectual property. Auro Infotech being adamant to the measures that adopted by protocol for safeguarding the intellectual property of our clients’. So it is really hard to hack our information or enter into our data without our permission. So Auro Infotech can assure that you can leave the fear of your intellectual property protection at bay. Auro Infotech signs non - disclosure agreement between clients and employees. We do not allow writable media on computers in our development rooms. Maintain a secure firewall with the public Internet. Physical security to control access to client information. We won't accept / engage in the projects from the competitors of our clients. When client outsource their project with Auro Infotech, the client can give a list of their competitors that we should not do business with. Moreover when we get a business project, which is similar to the clients’ product, we immediately inform the client to find if they are his/her competitors or not. So even if a client missed to give the list of his/her competitors, there is no need of worry. Assign software copyright to clients. Password protection of client source code information. Network partition and firewall for each client. Auro Infotech always values the specific pulse of our clients when they think to outsource their project to ODCs in India. We understand that, the clients outsource their projects to India to reduce their production; implementation and maintenance cost. We are liable to safeguard our clients’ intention. So Auro Infotech takes the special effort to produce the best in industry service to our clients in a reasonable expense. When a new client approaches to Auro Infotech, he has the facility to test the service quality of Auro Infotech offshore services by giving the task of a test project. The test project will be hard to executive in nature. The default test project price is used 10 per man-hour. By revising the skills require to execute a project, Auro Infotech decides the man - hour price of the project or man - month price of the project. The project of long term clients get the service of our expert developers in the fixed man hour charges of 15 UKD. The general man hour charge for short term clients ranges from 10 – 15 USD as per the skills required to execute the project. Auro Infotech offers post implementation support to the product that development has outsourced to Auro Infotech and giving support and maintenance service to the products that Auro Infotech developed and marketed by second party. Support and maintenance services are available in onsite and terminal mode. The price of service is depends on the skills and effort required to meet the needs. Are you interested in Auro Infotech offshore development services and think to explore it? It is quite usual that you may little bit confused on how you can start business with Auro Infotech. Auro Infotech follows an unwritten get started pattern for starting business with different clients. 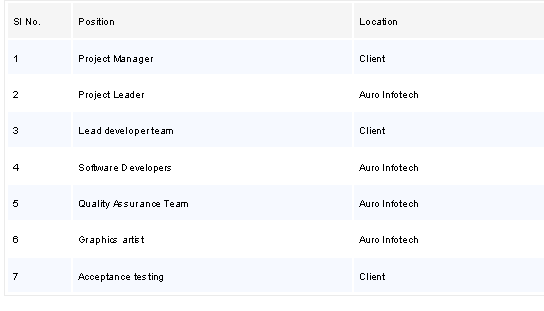 Client interested in Auro Infotech service. By exploring the information of our products, service, clientele, the client interested in Auro Infotech, and we give reference. The reference will be the software companies in UK, which is outsourcing their software Development to Auro Infotech facility. 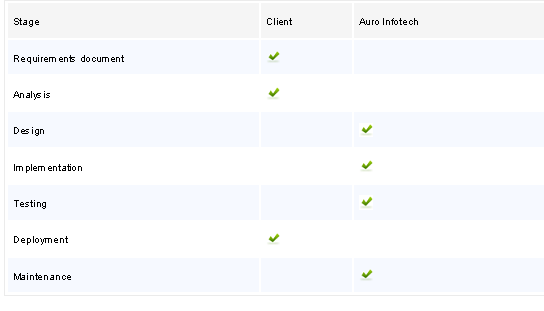 Client refers the proposed companies for understanding Auro Infotech service Excellency. Client gives the complicated test project to Auro Infotech development facility. Auro Infotech finishing the test project. Client evaluates the work and satisfied. Goes to the next step in the business deal with UK. Variations to this sequence are possible for client conveniences. The 9 keys which intend you to explore the quality software development service of Auro Infotech. 90%of our clients are long-term clients. One of our U.S clients has been outsource their product maintenance, programming and QA of their award winning product with Auro Infotech for the last seven years. Since we maintain an exclusive team for each client, the client gets the dedicated and controlled service same as that of our clients having an extended office at Auro Infotech facility. In Auro Infotech an employee sticks for a minimum of 5 years. So we can assure a staff till the end of project, in which he/she involved. We have our own QA experts (We have Load testing facility which can offer, only a few companies in India. You can instantly check the server load of 100’s of concurrent UKers who pass through heavy functionalities), tech - communicators, corporate communicators, graphic designing and SEO experts. Auro Infotech give non-disclosure agreement with Auro Infotech-client and Auro Infotech-employees. We have high quality software professionals with more than 9 years of experience in IT sector. Auro Infotech have the asset of reserve resources. So even though staffs go to unexpected leave, we can immediately substitute him/her with our reserve resources. Auro Infotech experts have versatility in international languages. It makes the communication. Auro Infotech provide excellent service to clients on simple terms. The pricing and costing methods are depends on the duration of the business that the client done with Auro Infotech. Auro Infotech always prefers client side interests. Auro Infotech looking for long term associations with business development consultants in U.S .The Business deal will be on mutually acceptable terms and conditions. We have different business models as compatible for the deal with business development consultants. Auro Infotech being open to 'n' number of business models as mutually beneficial to both sides. Please visit the Auro Infotech pool of business models to choose your kind of business models. Who can explore this offer? Business /marketing consultants who can refer /offer projects to Auro Infotech facility. The persons /personals /companies who can refer any clients /companies /persons with projects for outsourcing. Independent developers or developing personals. Auro Infotech will reward the consultants as per the nature of project that Auro Infotech get through the client who is referred by the concerned consultant. A software development company in UK conceptualized a product for resource management (CRM). The product was intended to be sold to Fortune100 companies in UK for managing their vast internal resources. The Company had its own manpower for software development. But due to other project commitments did not want to tie up the resources needed for this project. They also wanted to lower the cost of development taking into account the recessionary trends prevailing. It is the case that the company outsourced the product development. Auro Infotech had already carried out a project for the client. This project was much acclaimed by the end users for its functional utility and high-end graphics. The internal quality assurance team had lauded the project for its high quality. The post implementation support needed for the product was also commendable. The post project assessment by the client had specifically appreciated the Auro Infotech team of developers for the excellent teamwork. Above all, there was an appreciable reduction in the cost of development and Auro Infotech had delivered the product on time. Auro Infotech put forward the proposal to the company of an offshore development center and to implement the project by the remote delivery and monitoring methodology. An exclusive team of professionals will be dedicated for the project. The team composition required a team leader, Software engineers, QA experts, and technical communicators at Auro Infotech facility. The work will be replicated daily on the development server. This will facilitate daily review by the client and know about the up to date progress. A project manager will be in charge of the project at the client’s facility in U.K. The team at Auro Infotech in India will work up to noon UK and US time to have proper communication and coordination with the Project Manager of the client at client’s US and UK facility. The hardware and software platform will be mimicked at Auro Infotech to have the most reliable testing. Auro Infotech has a world-class development team which they could use as their own. The Auro Infotech team will act as an adjunct to the client’s facility. Considerably lower cost of development with high quality technical manpower. The development team will work at Auro Infotech to synchronize to noon UK and US time which ensure daily communication. Effective development of 24 hours utilizing the time zone advantage. The UK and US client need no hiring of manpower and hence no overheads. The requirements document was prepared by the client and handed over to Auro Infotech for development. The design, implementation and testing were carried out by Auro Infotech. We have developed software for following MNC companies Lenova and gopondy. The projects have been successfully completed .we have 100% customer satisfaction guaranty. Our products as well as our services have the ability to compete with international standards. Client can propose any business model as per their convenience. Or clients have freedom to choose compatible business model from our pre formatted business models. The financial benefits of offshore outsourcing have been appreciable - development, support and maintenance costs have been reduced considerably. The client found that Auro Infotech management overhead is lower than that of many software companies they had outsourced projects. They felt that many software companies over manage contracts by imposing additional project managers and unnecessary experts, which increases the overall cost. Auro Infotech has been extremely successful in consistently delivering high-quality applications on time and within budget. The Auro Infotech team of high quality developers led by the project management team and the lead developer team of the client were able to provide international standard to the product. The product could compete with a number of business applications from various countries. The business relationship has always been easy and smooth. The relationship has demonstrated that the balance of trust and control can deliver significant financial and management rewards. The client was fully confident of the quality processes and overall approach by Auro Infotech. The client admits that partnering with Auro Infotech was an intelligent business decision it has taken.